The statistics show that Botox treatments are growing at a rate of between 5% to 10% annually, and many dental patients are searching for Botox dentist or Botox dentists on the internet. By attending the IAPAM’s Botox training for dentists, you will now be able to meet your patients needs. The market for Botox treatments is growing. In a report published by GlobalData, “the global market for facial aesthetics is forecast to reach about $4 billion in 2017 at a compound annual growth rate of 9%. The growth is expected to be driven by minimally invasive procedures that offer long term results at competitive pricing.” The next logical step is get Botox for dentists, and for the to receive botox dentist training. 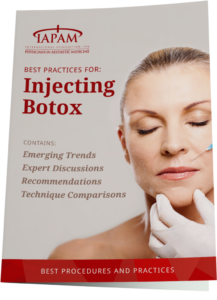 The key to Botox dentists capturing a portion of this growing market is by engaging in comprehensive, hands-on, physician-lead Botox Training like that offered at the IAPAM’s Aesthetic Medicine Symposium with Botox Training. Botox in dentistry is a natural progression. Catherine Maley, frequent contributor to the IAPAM and author of Your Aesthetic Practice (www.YourAestheticPractice.com) comments that a dentist sees “on average 8 dental patients per day. Pareto’s Law of 80/20 Rue says that 20% will convert to aesthetics if asked. That’s 1.6 patients per day multiplied by the average cost of a Botox treatment at $2350 and that equals $560 per day. Now multiply that by 22 working days per month, and multiply that again over 12 months,” and expertly trained Botox dentists can see their dental practice grow by over $100,000 in revenue in a year. Dentists can capture this growth by attending “all-inclusive” training programs, offered in medical facilities not hotel rooms, and lead by board-certified dermatologists and aesthetic medicine business experts, such as the IAPAM’s Aesthetic Medicine Symposiums, the IAPAM’s Secrets to A Successful Practice Seminars, and the IAPAM’s Advanced Botox and Dermal Filler Programs. Includes access to ALL the following: Patient medical history consultation form; Botox Consent Forms you can customize for your practice; industry statistics, and aesthetic medicine marketing resources ($250 value). Unlimited access to the most comprehensive Aesthetic Medicine on-line training for you and your staff for a year ($500 value). Complete aesthetic practice marketing program, including: how to get referrals from your existing patient base, how to hold open houses and get free media publicity. Comprehensive take-away training & marketing manual. Aesthetic Medicine Certificate (required by many medical malpractice insurance providers).